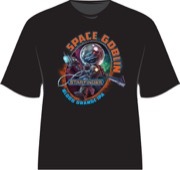 Celebrate your love of Starfinder, IPAs, and Space Goblins with this shirt! Screen printed in the USA on a 100% cotton black t-shirt. 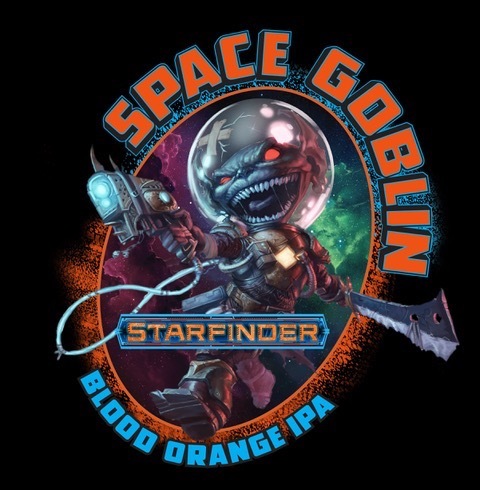 Everyone assumed that space goblins would be to Starfinder what goblins are to Pathfinder, because no one anticipated the popularity of skittermanders. But that’s okay—I like my (deep breath): Starfinder Space Goblin Blood Orange IPA T-Shirt anyway. The space goblin on the cover definitely pops, looking more creepy than cutesy with crazy red eyes. I don’t *really* get the “Blood Orange IPA” apart from a reference to violence and beer, so I wonder if there was a meme or joke I missed somewhere along the lines. Anyway, it’s a very cool design that surely elevates me to supreme nerd amongst all the other nerds at the gaming table.